For those of you who may not know us, we at Strickland Vintage Watches scour the globe for watches for our clients. Featured as a Forbes magazine's "Best of the Web" honoree for timepieces, we're committed to bringing the best, the rarest, the cleanest examples of old wrist and pocket watches to clients around the world. We've just returned from a buying trip through New England where we purchased, among other pieces, what appears to be a ladies Deco-era Waltham wristwatch in unworn condition – in its original box. We have done absolutely nothing to the watch other than clean, oil and calibrate the movement. Everything about this work of art – from its stretch bracelet band to its clamshell box, is original and untouched. We haven't even put a polishing rag to the case. It is, quite frankly, the finest example we've ever seen. And what a maker! So much could be written about one of the greatest watch houses the world has known — American Waltham Watch Company — that one could spend a lifetime cloistered like a monk, scribing all its accomplishments. Founded in 1851, the company later known as simply "Waltham" helped make timekeeping what it is today, and helped usher in the Industrial Revolution in the process. Waltham made pocket watches for both sides during the Civil War, beginning a wartime commitment that continued through two world wars and a hundred years. Waltham was arguably the first American manufacturer to jump into the newfangled "wristlet" market during WWI, providing troops with watches they could strap to their arms. 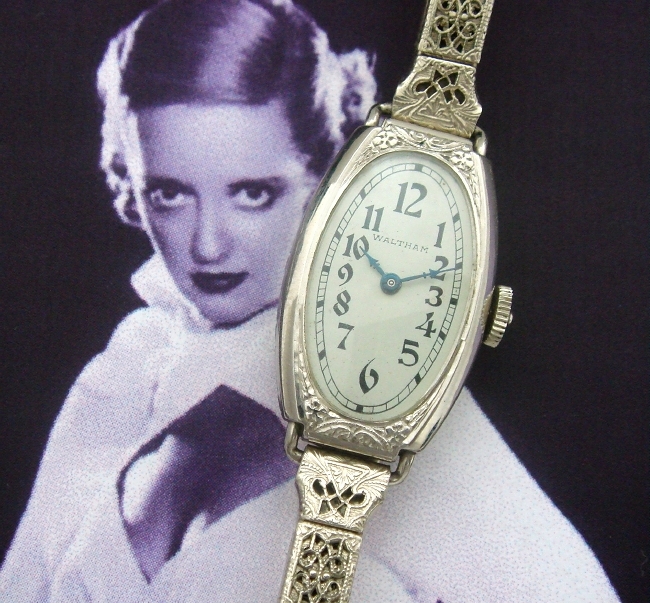 These early wristlets evolved into the wristwatches we know today.